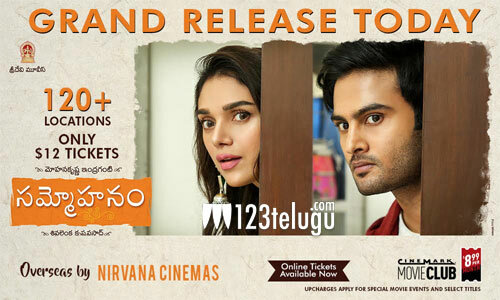 Sammohanam starring Sudheer Babu and Aditi Rao Hydari and directed by national award winning filmmaker Indraganti Mohankrishna is hitting screens today in USA. Indraganti Mohankrishna, who is riding high on success after Gentleman and Ami Tumi has come up with a novel story line where a common man falls in love with a reel life heroine. Trailer that was released few days ago also promises loads of comedy. It is It is releasing in more than 120 Locations in USA with affordable ticket prices. Sammohanam has been having positive vibes from the day the first look poster was released and it kept on increasing with each promo. Finally, the day is here where you can watch the beautiful visuals by PG Vinda, soothing music by Vivek Sagar, and a novel story line by Indraganto Mohankrishna on big screen. All drives and KDM’s are delivered to theaters and premieres are on time as planned. Online ticketing is up and you can book your tickets now. Experience the magic on big screen.